President Donald Trump displays a presidential memorandum he signed, declaring the opioid crisis a public health emergency in the East Room of the White House, Thursday, Oct. 26, 2017, in Washington. Late last month, President Donald Trump gave another White House speech about the country’s devastating opioid crisis and promised federal help to ease the disaster that is killing 142 Americans per day. But, just like August’s promises, they are half measures, not backed by the federal support, especially financial, needed to make a difference. In August, Trump pledged to declare the opioid crisis a national emergency, which would have made much greater sums of federal money available and empowered medical providers. It would also have sent a powerful message that the Trump administration is finally getting serious about working with states to combat addiction and its deadly consequences. In a speech late last month, however, Trump said he had directed the Department of Health and Human Services to declare the opioid scourge a “public health emergency.” This will free up a little bit of grant money and encourage the use of telemedicine to better serve rural residents. These are helpful steps, but they are way too small to make much difference at a time when a serious commitment, backed by an investment of billions of federal dollars, is needed. In his remarks last month, Trump again showed he fails to understand the opioid crisis and how to solve it. “This was an idea that I had, where if we can teach young people not to take drugs, it’s really, really easy not to take them,” he said. To accomplish this, he added, the government would produce “really tough, really big, really great advertising” that would encourage Americans not to start using opioids in the first place. This “just say no” approach has failed miserably. Harkening back to it is misguided and dangerous. Instead, a commission created by Trump offers the way forward. The President’s Commission on Combating Drug Addiction and the Opioid Crisis recommended attacking the addiction crisis as the public health problem that it is. It called for expanding the ability of Medicaid to cover addiction treatment. It called for expanding the use of medication-assisted treatment such as methadone and buprenorphine (known commercially as Suboxone). And it called on every local law enforcement officer in the nation to carry naloxone, to be able to quickly reverse an opioid overdose and save a life. These are concrete steps, backed by research on their efficacy, that will make a difference. Yet, the report has been largely ignored by the Trump administration. The biggest impediment to many of these recommendations is that they run counter to the Trump administration’s rhetoric about substance abuse and medical care. The commission, headed by New Jersey Gov. Chris Christie, did not call for the hiring of more police officers or the construction of a border wall to reduce the flow of illegal drugs through Mexico. Instead, it rightly focused on proven steps that should be taken to reduce the death toll from what is a medical and health crisis, in terms of treatment for those who already are addicted to opioids and preventing new addictions by tightening the supply of these drugs, most of which are obtained with prescriptions. 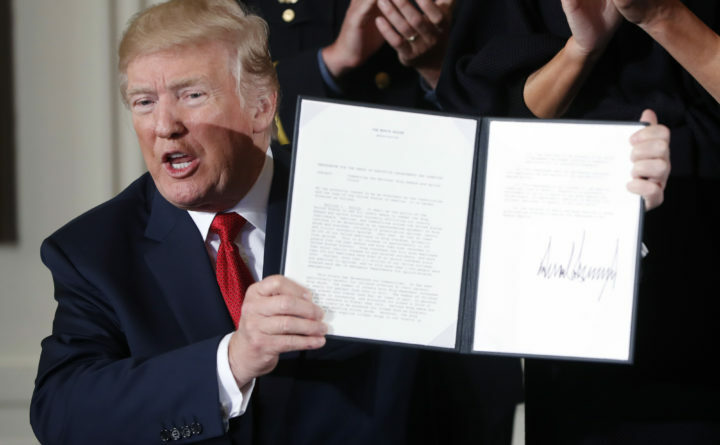 The U.S. desperately needs a leader who makes stopping the opioid crisis a priority with a commitment to federal support of what works: Medication-assisted treatment, federal and state reimbursement rates that aren’t so low that they dissuade medical providers from offering this treatment, the elimination of time limits that often cut short needed treatment and an expansion, not contraction, of Medicaid to enable more Americans to access treatment. If Trump is serious about combating the opioid epidemic, he’ll stop the pointless rhetoric and get behind policies that are proven to work.